Government in America is too big. We are not (yet) at European levels, but unless we turn around the reform trend in the welfare state - which currently points to even bigger government in the near future - we are going to end up with the same macroeconomic problems as the Europeans have. Our government has sprawled in many directions, first and foremost through the expansion of entitlement programs. This, in turn, has led to a distortion in the operation of our government sector that adds to the difficulty of reforming away our welfare state. 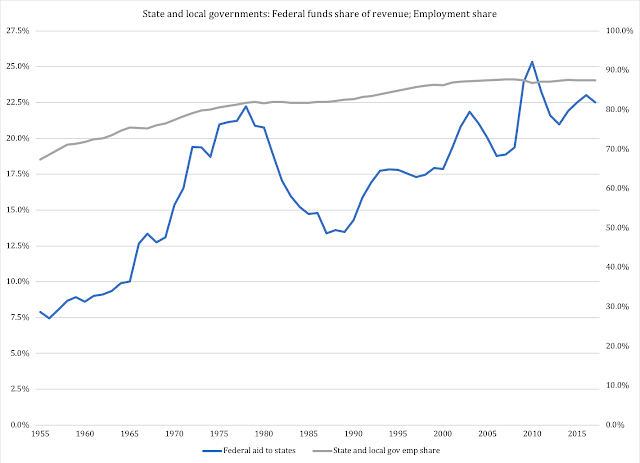 It consists of the combination between, on the one hand, a shift in government employment toward states and local government and, on the other hand, an increase in federal funding of the entire government sector. The majority of the federal government's 2.8 million employees do other things than defend our country and provide for a critical part of our infrastructure. Not all of the rest of the workforce is idling in the welfare state - the federal government must also provide law enforcement and run its part of our judiciary - but the fact that the two constitutionally mandated functions represent less than half the total workforce is a wake-up call as to what we are asking, and what we should be asking, our government to do for us. While the federal workforce has gradually shifted priorities away from its constitutional duties, states and local governments have grown their employment over time. 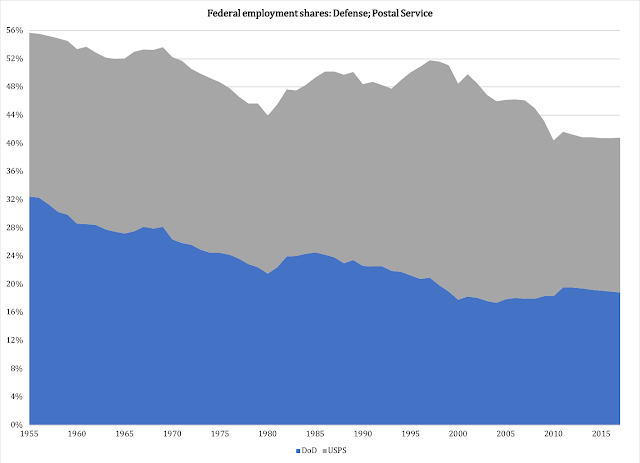 They have increased their combined share of the total government workforce from 67 percent in 1955 to more than 87 percent today. This increase reflects a growth in the responsibility of our states to produce the entitlements that our welfare state hands out. Instead of running programs such as Medicaid, SNAP, WIC, TANF etc., at the federal level, Congress has structured these programs in such a way that the operational responsibility falls on the states. To honor their responsibilities, the states obviously needs to hire more people. These two trends tell us that we, simultaneously, have localized government employment and centralized government funding. Since the first trend means increased local responsibility for government functions, these two trends together create a mounting obstacle to reforms that could turn the growth of the welfare state around. With more of the operational responsibility at the state and local level, and more of the funding at the federal level, where do we start if we want to reform welfare, Medicaid and other parts of the federally sponsored conglomerate of entitlements? Theoretically, the answer is Congress, because they provide the funds and define the programs they help paying for. In practice, though, there is a great risk that Congress draws down funding without rolling back the entitlement mandates in the programs. This would leave the states with a greater funding responsibility, one that they have to pass on to taxpayers. Another option is to start at the state level and ask state legislatures to change these programs. However, Congress could retaliate to any reforms it did not like, by drawing down funding of the reformed program as well as others. Again, states would be forced to raise taxes. There is a way out of this, called block grant reform for the states. I developed a model for it six years ago. It remains to be seen if it can get some traction in Congress.